For my last read before I go away on my Christmas break, I stepped out of my comfort zone into historical fantasy. Into the world of witches, daemons and vampires. Promising to suspend disbelief, I took a brave step into the pages of something tagged as "...irresistible to Twilight fans..." No, I am not a Twilight fan. But they did call it Twilight for grown-ups, and I AM grown-up now, aren't I? The book starts out on a very promising note. Set in the Bodleian Library in Oxford - in the Duke Humfrey's reading room no less - descriptions of the original 15th century part of the library, the rows of Elizabethan reading desks with scarred writing surfaces, Gothic windows directing attention to coffered ceilings with gilding picking out the details of the university's crest would make any booklover drool and swoon. Dr Diana Bishop, a historian of science and alchemy, has ordered and recalled a rare 17th century manuscript. She takes it to her favourite reading spot, takes notes and returns the manuscript when done. 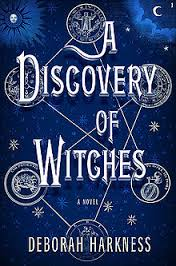 Diana also happens to be a witch, descendant of Bridget Bishop - the 1st person executed for witchcraft during the Salem witch trials. And there really are witches, daemons and vampires around humans, masquerading as humans at all times. They choose professions to match their characteristics - for e.g. vampires, who can live for centuries, often choose to be in laboratories. The solitary work habits make them less likely to be recognized by too many people making an abnormally long life span less noticeable. Diana's parents were powerful witches who died under mysterious circumstances when she was 7. Believing magic to be the cause of their downfall, Diana refuses to use magic and tries to build a legitimate "human" life and credibility instead, working her way up the world of academia. So this was the good part of the 700 page book. History, libraries, magic, mysterious rare manuscript - what could be in it that would cause so much attraction of these other worldly creatures? A good start for a suspense novel. From here on however, I feel the book goes downhill. The pace slows to almost a dead stop as more and more plots are introduced - romance, rules of inter-creature relationship, a Congregation of these creatures. It also moves from a great mystery-suspense-historical fiction to a romance novel with allusions to some mystery. Flashes of brilliance come through sometimes, particularly towards the end when every character's back story has been dealt with. But overall, I feel this could have done with some serious editing to keep the storyline tighter and needless details and overwriting out of it. Right after a life and death situation, I do not want to hear about Halloween (human) trick-or-treaters going about their candy collection. The other thing that grates on me is the character of Diana. Starting out as a workaholic, independent, sporty, highly accomplished historian and academic - she morphs within days (no exaggeration) into a helpless woman that is almost taken prisoner by her new boyfriend. He sedates her when he needs to control her, tells her she must obey him at all times, keeps secrets and flies into an unpredictable rage anytime she mentions anything he thinks she should not. Oh, and apparently when they kiss in front of his mother they are "married", no consent needed, no questions asked - actually the bride does not even KNOW they are married. Yet Diana loves Matthew like there is no tomorrow! Stockholm Syndrome, anyone? There are 2 more books in this trilogy. Given the plot sped up towards the end and we know the back stories of most of the characters, I would hope they are better. I might get them in the new year to see how the mystery of the manuscript will be resolved. But I sure do not feel the urgency that a great series brings.